The Midair Squadron is delighted to confirm their appearance at the 2014 B/E Aerospace Festival of Flight at Newcastle, County Down in Northern Ireland, on Saturday 9 August 2014. Canberra XH134, the world’s only airworthy Canberra PR9, is one of only 23 of these aircraft to be manufactured by Short Brothers and Harland Ltd in Belfast between 1958 and 1962. The Canberra is believed to be the longest serving aircraft in RAF history, and was only retired from active operation in July 2006. Midair Squadron’s Canberra PR9 is welcomed to home turf at Newcastle Festival of Flight, Northern Ireland, flanked by both Hunter T7’s. 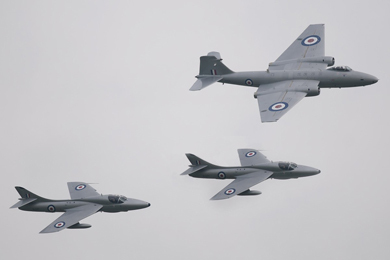 Enroute to Newcastle for the Festival of Flight, the Midair Squadron will overfly the venue where the Canberra’s sister, XH131, as part of the collection at Ulster Aviation Society’s site at Long Kesh. Following the type’s retirement, XH131 was donated to the Ulster Aviation Society by Midair Squadron owner, Mike Davis, and was transported by road to the Society’s base in 2010 as part of a Heritage Lottery Fund (HLF) support project to conserve and explore the heritage of the aircraft. Born and raised in Northern Ireland, Flt Lt Mike Leckey, Midair Squadron’s Chief Pilot, will be at the controls of XH134, which will be flanked by both Squadron Hunters. Schooled in Belfast, Leckey joined the Royal Air Force in 1988 and has flown over 2,700 hours on the Canberra during his time in the military. Jeff Salter, B/E Aerospace Festival of Flight organiser added: “It was the Canberra B5 prototype which held, and indeed may still hold, the Atlantic crossing record from Aldergrove to Gander and back in 10hours 3 minutes. The record being achieved in 1952.